Ingredients: Spices, Salt, Whey (from milk), Onion*, Sugar, Bleached Wheat Flour, Malted Barley Flour, Paprika, Cocoa, Citric Acid, Corn Oil, Garlic*, Paprika Extract. Brown 1 pound ground beef in a skillet. Drain off excess fat. 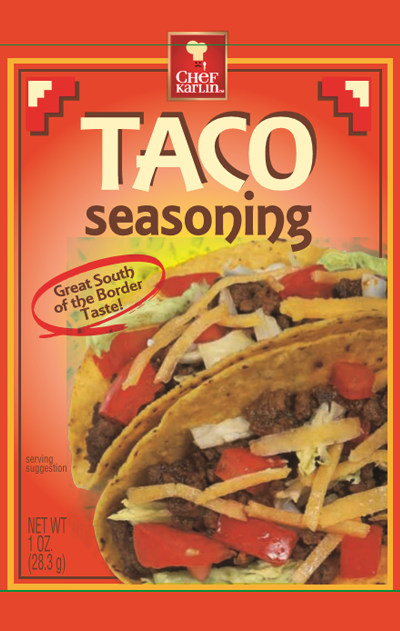 Stir in Taco Seasoning with 2/3-cup water. Mix well with browned beef. Bring to a boil, reduce heat and simmer 7 to 10 minutes, stirring occasionally. Spoon hot meat filling into taco shells and top with shredded cheddar cheese, chopped tomatoes or chopped onions, as desired.